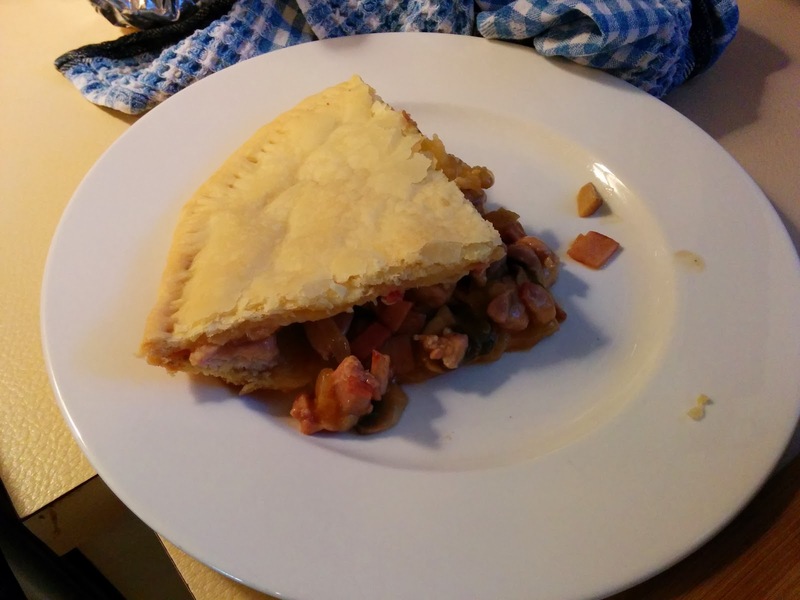 Tonight's pie - the second last of the pies in this Year Of Pie - was a yummy chicken pie. With bacon, mushroom and Pinot Grigio. I made it up as I was going along, and the wine I was drinking as I was cooking it was tasty, so I chucked some in. Yum. 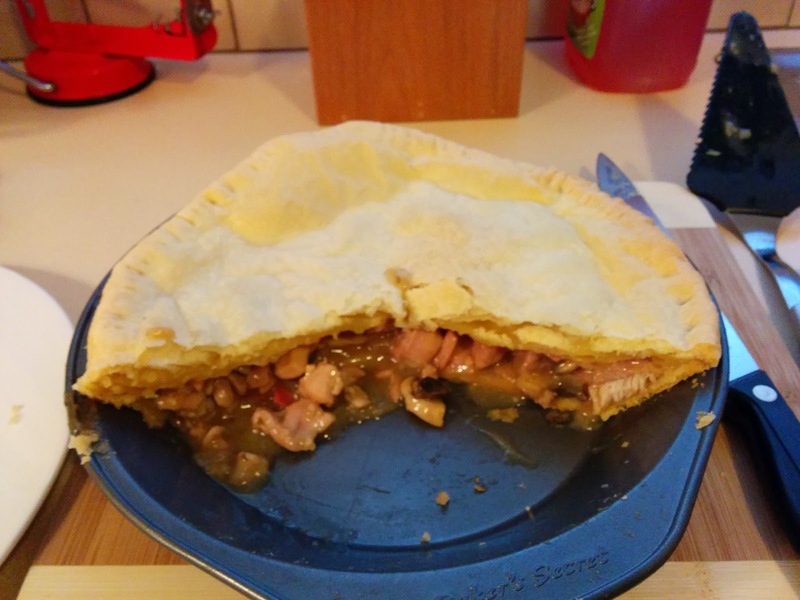 The base was shortcrust and the top a rough puff. Along with the other ingredients already mentioned, I threw in an onion, a chicken stock cube and a light sprinkling of salt, pepper and rosemary. It all came together rather nicely. Prepare the pastries beforehand so they can chill. Remember that the rough puff needs to be folded and chilled several times so plan ahead a few hours. This is a good pastry to make during the day on a weekend spent at home since each fold and chill takes only a few minutes. Blind bake the case. This takes about 30-40 minutes so while it's going you can prepare the filling. Fry up all the filling bits however you'd normally do it. You might also like to add some cream (about 1/3 cup I suppose) but I'm happy with how it came out without that. Just before you use the filling you should thicken it up with some flour. Just sprinkle some on, stir and repeat until the gravy is thick enough. Fill the pie and top with the rough puff and bake for 40 minutes. Add an egg wash if you can be bothered. As you can see from the photos I didn't. What I like about this pie is that I'm quite comfortable making it (or something like it - whatever filling) as just a thing we can have on a weekend. Thanks to this Year of Pie I find it quite easy to make the pastry and do all the construction. What a wonderful thing!